MADAM CHANCELLOR, born in 1948 in the Tahltan community of Telegraph Creek in northwestern British Columbia, Dempsey Bob survived dire circumstances and an unsympathetic school system to train in the Tahltan-Tlingit style of Aboriginal art. Today he is internationally regarded as one of the foremost Aboriginal artists of his generation, and his sculptures, castings, jewelry and prints are seen by countless visitors to museums, galleries and public spaces around the world, including Vancouver International Airport. In a recent lecture at the First Nations Longhouse, he recounted that as he progressed as an artist, he had few teachers, as people knowledgeable in the traditions of Tahltan carving had greatly diminished in number owing to the decimation of Aboriginal communities whose artists had developed the work over multiple generations. His accomplishments therefore extend beyond his vast body of work to include the reclamation of identity and culture of earlier generations. His carving career began in 1969 under the teaching of Haida artist Freda Diesing, and within five years he had produced the first of a vast litany of major works whose quality and unique characteristics are demonstrated by their presence in many of the world’s most notable galleries, including the Smithsonian Institute, the Columbia Museum of Ethnology, the UBC Museum of Anthropology and the Canadian Museum of Civilization. 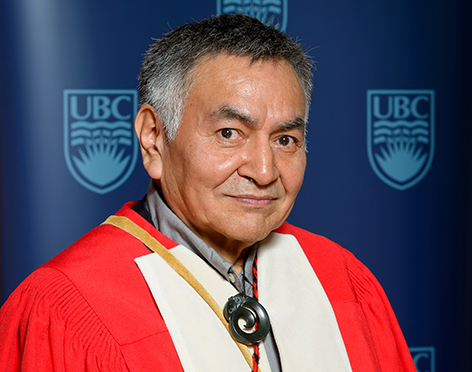 After four decades of commitment to northwest coast Aboriginal art as both practitioner and teacher, he has inspired two generations to learn and excel, and his contributions have been recognized with many honours and awards, including his appointment just this year as an Officer of the Order of Canada. Madam Chancellor, in recognition of his work as a foremost artist and as a cultural preservationist and ambassador, I ask you to confer the degree Doctor of Letters, honoris causa, upon DEMPSEY JAMES BOB.